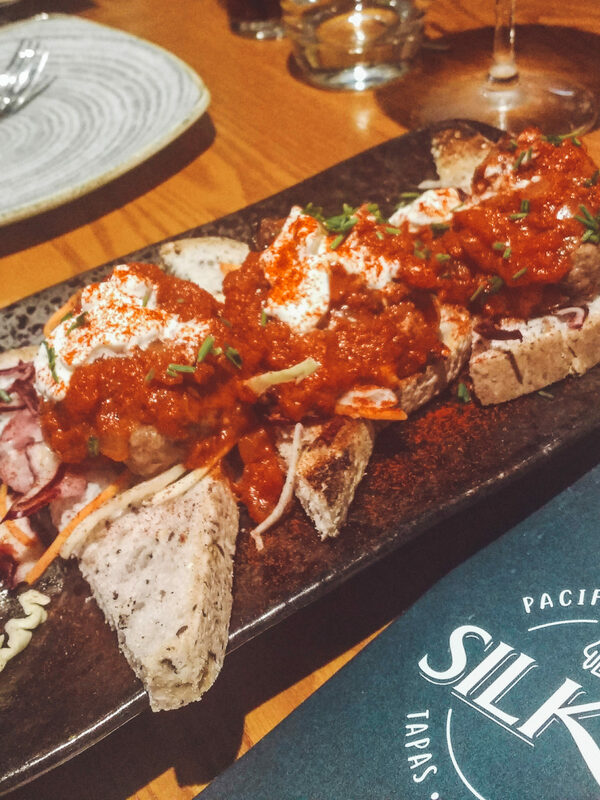 I recently had the opportunity to try out Silk Rd – a tapas and meze restaurant with a menu inspired by the famous Silk Road trade route, an ancient network connecting East to West. Read on to see what I thought. 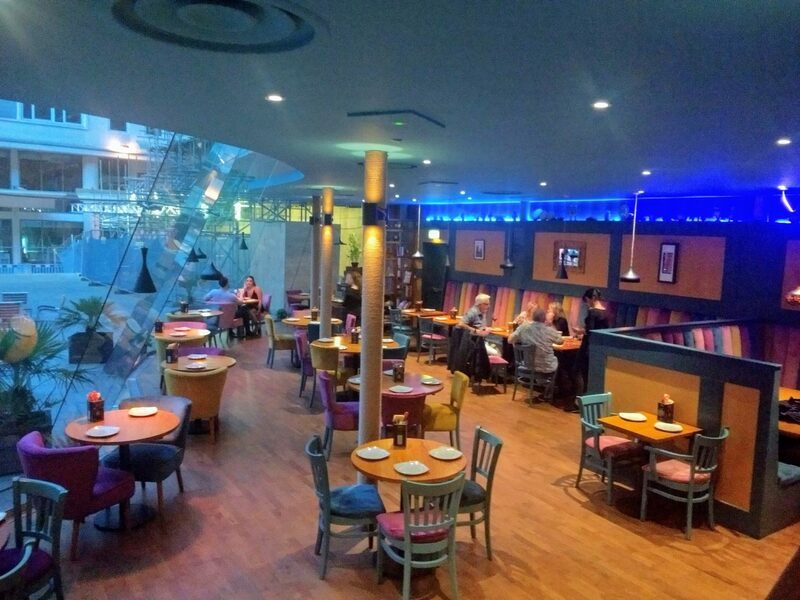 Silk Rd Liverpool is situated in Beetham Plaza right by Liverpool’s famous waterfront. It’s the second venture from owner Javier Mellado, who opened the Heswall branch in 2017. As I don’t cross the water much I hadn’t actually heard of Silk Rd before, but upon receiving my invitation from the ladies at Pink Media was excited to see what they had on offer. Although the restaurant is right on the waterfront, it is tucked upstairs, so it may not be immediately obvious if you’re coming along The Strand – I nearly missed it! Arriving a little bit late, I was welcomed by the lovely ladies from Pink Media and we all received a welcome talk from Javier, who explained a little behind how the restaurant came to be. The passion behind the brand and the food it serves is apparent. The concept of the menu is inspired by the original Silk Rd, a trading route that connected the east and west. 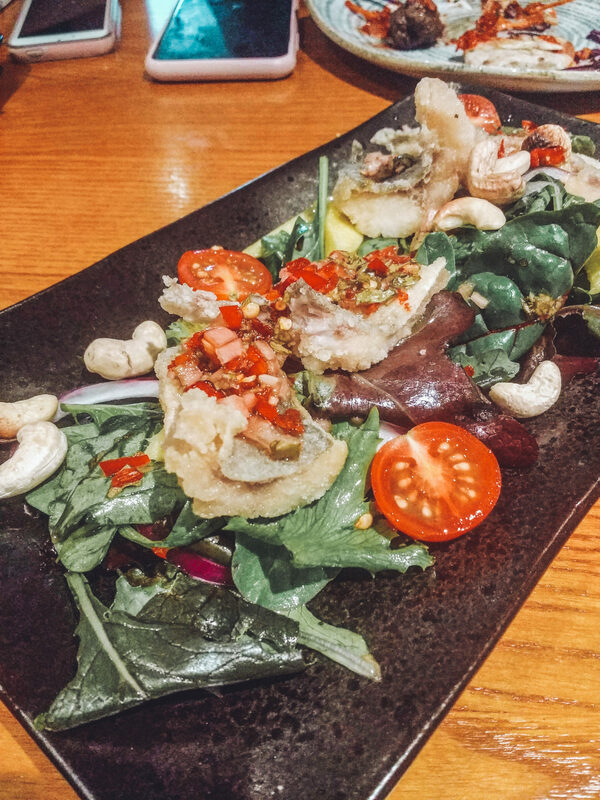 This is why the dishes on offer are influenced by a range of cultures and flavours – you can taste everything from Asian Curries through to Spanish Tapas. My fear was a concept like this was that it may end up feeling a bit “world buffet” – one of those places that serves a bit of everything without anything actually going together. I was pleasantly surprised then that Silk Rd have pulled off the range of flavours on offer, whilst keeping a pleasant atmosphere and offering a range of gluten free options. Now, if you know me at all, or have read my blog, I don’t need to tell you what my favourite tipple is! So you can imagine how excited I was about Silk Rd Gin Passport! 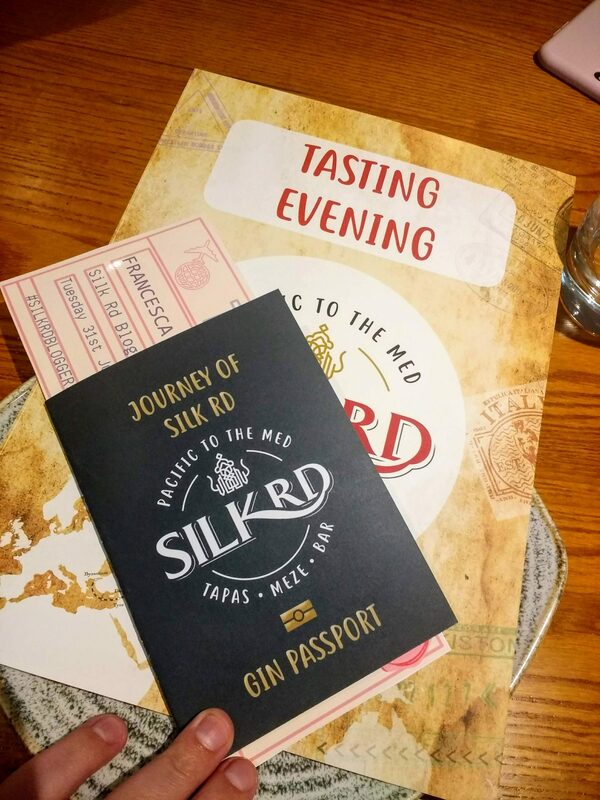 Tonight I've been at another wonderful blogger dinner with @pinkmedialtd at @silkrd_tapas – we've been spoiled rotten with both food and gin! 🐷 Tonight they had three gluten free peeps to contend with – thank god for Tapioca flour! 🙌 Can you believe this place actually has a gin passport! You work your way through it and when you complete it you get entered into a prize draw! 😍 Three down tonight, I highly recommend the @ginmare perfect serve! 🍸 Blog post coming soon! Whether you’re a G&T fan or note, the Gin Passport is bound to encourage you to try something different. It recommends 10 different gins, all served with the perfect tonic and garnish. Whenever you order one, you get a stamp. Once your gin passport is filled, you can be entered into a prize draw to win a mystery prize – anything from a bottle of gin to a holiday! So basically you get rewarded for drinking gin. Sign me up! We worked our way through three gin throughout the evening – first a Martin Millers perfect serve, with FeverTree Elderflower Tonic garnished with strawberries and black pepper. With our main course (seriously, this gin pairing thing is revolutionary) we enjoyed a Gin Mare perfect serve, with orange rosemary and FeverTree Mediteranean tonic. Rounding off the night was a Malfy Con Limone perfect serve, with fresh lemon and Fever Tree Tonic, described by General Manager Adam as a palette cleanser. Enough about the gin, what about the gluten free food? Trust me to dedicate a whole section to the drinks eh? Anyway, onto the food. I was relieved to find myself not the only one with dietary requirements on the night, as I was sat alongside Laura from Gluten Free Culinary, and Liverpool fashion blogger Laura Roche, both of whom have Coeliac Disease. It’s nice to be able to chat to someone sharing a similar experience – even though I’ve been told after testing that I don’t suffer from CD, I’ve found that my tolerance for cross contamination is lessening as time goes on and I do have to follow a strict gluten free diet. Javier was very attentive to the three of us, explaining the situations with the gluten free options on the menu and how they are prepared. The majority of dishes on offer are already gluten free or can be adapted to be so – no wheat flour is used in main meals, the kitchen uses tapioca flour where flour is required. He did explain that normal flour is used in desserts, however these are prepared in a separate area of the kitchen. he did say however that as it is a shared kitchen with limited space and facilities, staff are very attentive to avoid cross contamination as much as possible. 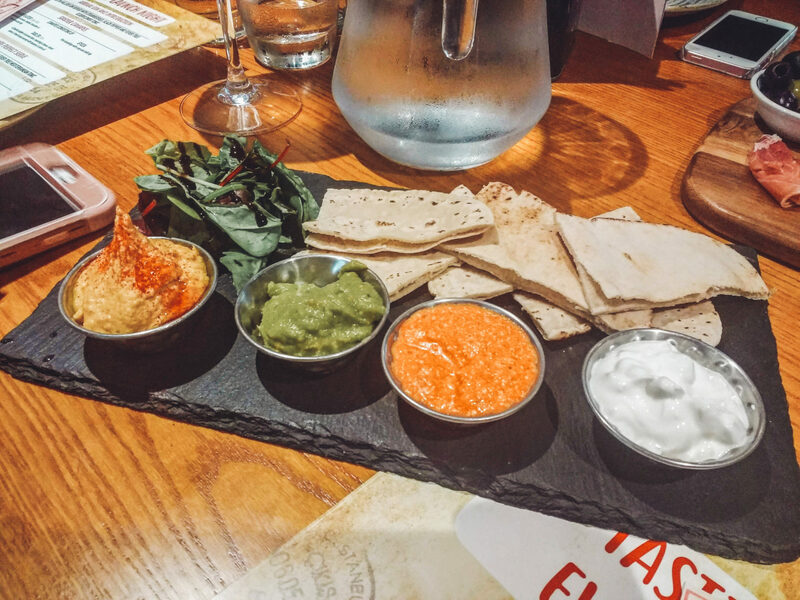 This was our first starter, a platter of gluten free pitta bread served with a range of dips – hummus, tsatsiki, Asian avocado and tirokafteri. All were delicious but I’m definitely more of a hummus girl! The three of us who were gluten free all commented how good the gluten free pitta bread was – I certainly wouldn’t have guessed that it was safe for gluten free if I hadn’t had been reassured – it was way too good! I’m a big patatas bravas fan, but I don’t think I’d ever come across this before. 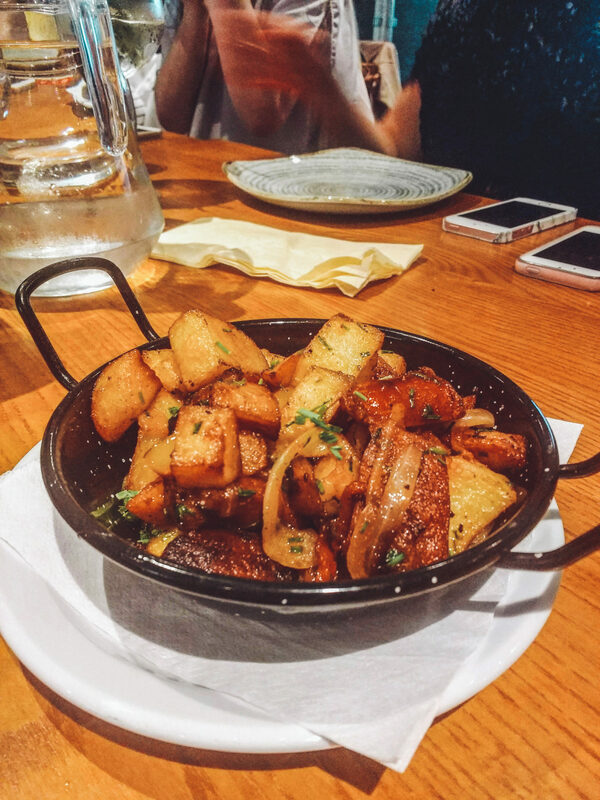 This Spanish tapas consists of potatoes with chorizo and peppers – so delicious! 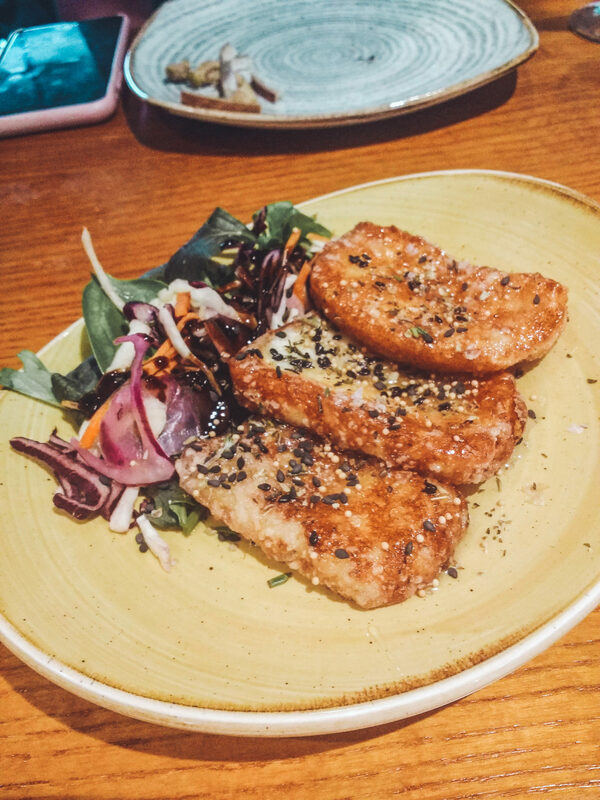 I’ve heard a lot of hype around halloumi before but never tried it – WHY DID NOONE CONVINCE ME? If it’s anywhere near as good as this was, I’ve been missing out. Fried in honey and herbs – it was like a out of body experience. Definately worth going just to try the halloumi! I love seafood however this was something that wouldn’t have jumped out at me on a menu – it was a very fresh tasting dish though. The fruity mango tones down the tanginess of the chilli, accompanied with shallots & coriander and topped with cashew nuts, it turned out to be a really yummy dish. These were a type of beef kebab served with spicy tomato sauce with Greek yoghurt. I’ve got to admit, I would have loved this a lot more without the paprika flavour. Also as wonderful as it was to be offered with gluten free bread, I didn’t love the bread. This was a chickpea & sweet potato curry from Pakistan. I have a confession to make, I was so stuffed at this point I think I only tried a tiny bit of this. As much as I think the range of flavours work well together I wasn’t quite as sure about trying curry alongside some of the other dishes we’d eaten. I have no doubt that if you like cauliflower this is delicious. 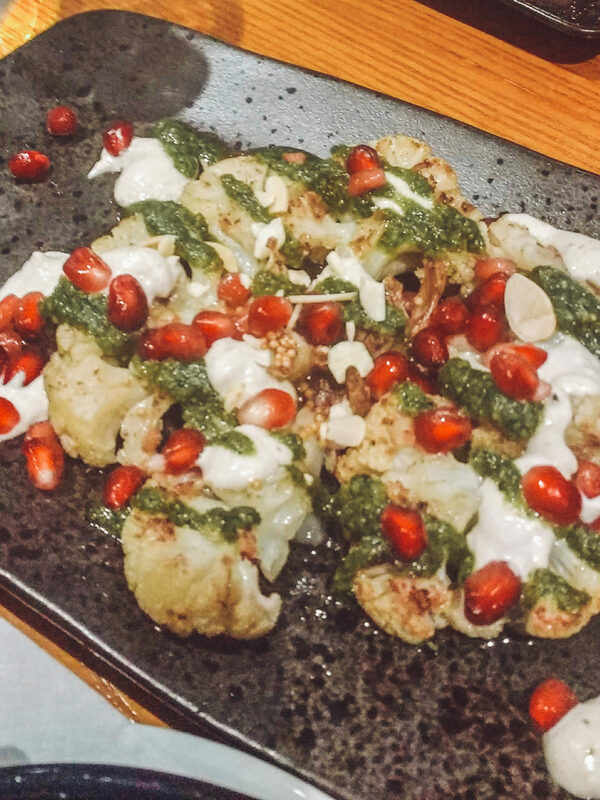 It was served with ras el hanout (an African spice mix) with coriander, almond pesto and pomegranate seeds. I loved the flavours, I just really struggle with the texture of cauliflower for some reason. Flavourwise though, lovely! 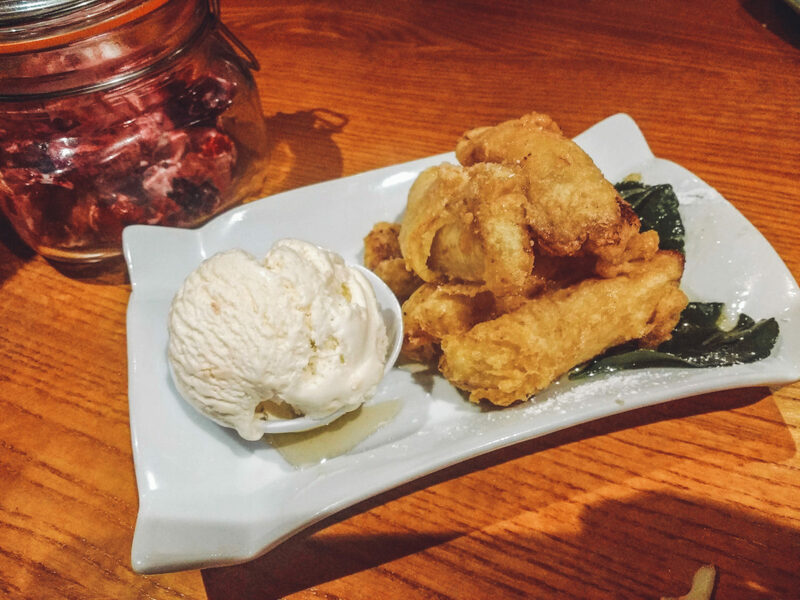 Us gluten free diners weren’t supposed to get this – it’s one of the options that isn’t normally gluten free – the absolute sweeties managed to knock it together for us so that it was gluten free though! It was perfectly accompanied by coconut ice cream and it was HEAVEN! I’m sad I didn’t make my mum try this when we went – I think she’d love it! I’m not normally an Eton Mess girl, or I thought I wasn’t, I think between this and my dessert at Chilli Banana I’m changing my mind. This perfectly blended Fruit of the Forest with Chantilly Cream and Meringue – so yummy. I kind of wished it wasn’t served in the jar though, I just found it a little awkward. I’ve actually been back to Silk Rd twice since the blogger dinner, once with my parents and once on a girls night out. I love the range of gluten free options available, and think overall everything I’ve tried is really yummy. I love the concept of the gin passport too, it definitely encourages you to try some new spirits! 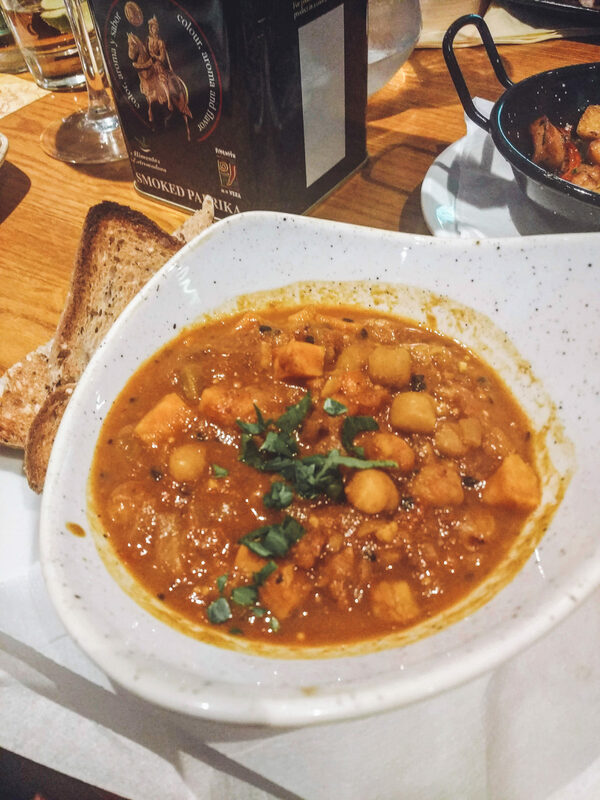 I do think you have to be someone that enjoys the tapas concept to like this place – I took my parents and I know my mum prefers a traditional restaurant experience where you eat a full meal. Where is Silk Rd Liverpool? 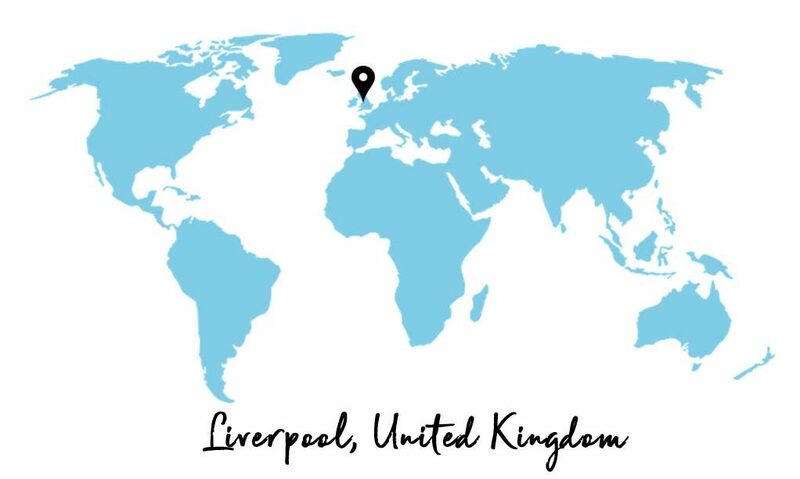 You can find Silk Rd Liverpool at Beetham Plaza, 25 The Strand, Liverpool L2 0XJ, just around the corner from James Street station. *I was invited to eat and drink at Silk Rd as a guest of Silk Rd Liverpool and Pink Media, however all views are my own. 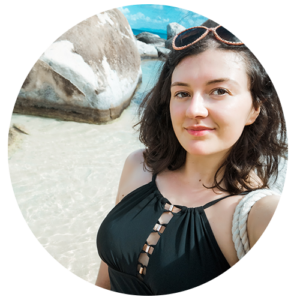 Check out my other posts on Gluten Free Liverpool!